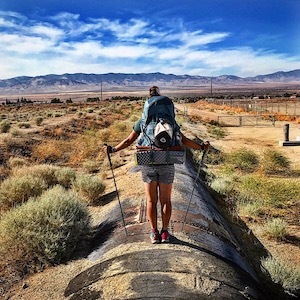 What Am I Bringing With Me On the PCT? It’s now less than two days before I start my thru-hike on the PCT. All of my emotions have been bubbling up to the surface over the last week – excitement, fear, nerves and anticipation. It’s crazy to think all of the planning, preparation, research, gear purchases and numerous training hikes has finally come to this. These final moments with my family, my last few warm showers, one last load of laundry, easy access to running water and my final meal at In-N-Out Burger will be savored over the next 48 hours. Over the last year of planning this thru-hike, I’ve spent countless hours thinking about and finally deciding what I will be bringing with me on the PCT. Making the choice of what to put in and what not to put in my pack have been some of the hardest decisions I’ve had to make during this whole planning process. Is it possible to know everything I’d need to have with me while hiking over 2,650 miles, in three states, over the span of five months? What would I absolutely need? What could I do without? What would be deadweight in my pack? Anything I put in my pack has to be carried by me on my back. Obviously, the less stuff I bring, the lighter my pack, ultimately making it easier to hike 20+ miles a day along the PCT. My overall base weight, minus food and water, is 23 lbs. This is a little high according to PCT hiking standards. Most PCT hikers aim to have a base weight in the range of 15-18 lbs. I’d like to get there, but after countless pack shakedowns and endless hours going through my gear, I couldn’t decide what else I could live without. At this point, I really won’t know what else I can shed from my pack until I get on the trail and start hiking. For now, every single piece of gear has been weighed, added to my lighterpack.com profile and has a value attached to it, meaning I have a strong reason as to why each piece of gear is in my pack. This pack is a bit on the heavy side, weighing in at 4 lbs, but the comfort factor has me sold making it well worth it’s weight. I’m recovering from a shoulder injury and even with the pack fully weighted down, it’s still comfortable enough to wear without aggravating my shoulder. I love the fit, pack design, how it feels on my body and the hip pockets. I refuse to hike without hip pockets. I opted for a two-person tent even though I’m solo hiking because I like having the extra space to keep all my gear inside. I don’t feel claustrophobic in this tent and have plenty of room to spread out should I need to. Since the weight difference between the one and two person tent wasn’t all that much, I opted to have a bit more space. I originally had a heavier inflatable sleeping pad that weighed 2 lbs. I discovered the NeoAir XLite through the recommendation of another hiker, tested it out and happily made the switch. My new pad is comfortable and only weighs 12 ounces! I could use bunched up clothes as a pillow, but I opted for an inflatable pillow. It weighs and folds down next to nothing. Again, truly a comfort thing. All of the other items in my sleeping system were chosen because they will either help keep my sleeping bag clean and dry or make it warmer should I run into some super cold nights out on the trail. Town clothes are used to wear while in town, while washing hiking clothes at a laundromat. Some people opt to wear their rain gear while running errands in town and doing laundry. I opted for a lightweight outfit. Thanks Salomon! Since I’m used to hiking in the PNW in all of my cold weather warm layers, it makes it really hard to let any of these items leave my pack. I’ll be starting in the desert where it’s forecasted to be hot and sunny, but I want to make sure I’m prepared for the cold nights and early mornings. I’ll be saving the rest of my rain gear for Washington. My microspikes will be in my box sent ahead to me in Kennedy Meadows for the Sierra portion of my PCT hike. Plain and simple, I don’t want to get lost. These are all VERY necessary items needed for my hike. In my toiletries bag, I only have enough supplies/vitamins needed to hold me over until I hit my first zero day in Big Bear Lake. In Big Bear Lake, I’ll be reunited with my bounce box and resupply these items. Some hikers shed weight by going stove less. Not me! Having a warm meal for breakfast and dinner will be a huge morale booster out there. I know thru-hiking will be a suffer fest, but there’s no sense in making my life downright miserable by denying myself a warm meal. This whole section is technically considered luxury items. As a P3 Hiker for the PCT Association this year, I will be documenting my hike along the way through the images I take and the blog posts I write. In order to do this, I’ll need a camera and phone for documentation and the means to be able to keep all of my electronics charged while on trail until I get into town and am able to recharge everything again. This system will be my means to filtering water and storing it in my pack. I was going to go with the Platypus Gravity System for a water filter, but once I realized it was almost double the weight of my Sawyer Squeeze, I quickly put the Sawyer back into my pack. Please note, this above gear list is subject to change once I start my hike. In fact, it most likely will change in some shape or form. As I mentioned before, I have no idea what I can live/live without on trail at this point. As I come across items in my pack that aren’t being used, I won’t hesitate to send them back home. It will be super interesting to compare my start pack list to my finish pack list. I can’t wait to see what stayed in my pack and how my base weight shifted throughout my hike. good luck on your venture and look us up when you get up here to Chester the Half way point on the Trail. This is soooooo exciting. Can’t wait to follow your updates!! When you’re finished, I’d love to see what you would have done differently. Yes! Absolutely! I would love to share all my trip notes with you. I’m stoked you guys are going to hike the PCT!